The management imagines Sao Paulo’s Bohemian set “thankful” and “reverent” at its resurgence in 2001 “on the most famous corner of the city”. It claims an enticingly varied musical and gastronomic offering. Quite a reputation to live up to. Tonight the music comes from Paulistana roots sambista Carolina Soares, who appears regularly. What we have here is a music emporium. On the Boulevard terrace, the traditional Riverboat’s Jazz Band – trumpet, banjo, washboard, euphonium – complete with straw boater hats and red or black sleeve suspenders play New Orleans tunes for the punters while the parking manobristas drive away and return cars. They are playing as we go in, and still in full swing two hours later. They’re good, even with the over-familiar tunes. Inside, a singer-guitarist is the first sight to greet you from a high stage. As you go further in, you notice access to an upstairs area – lounge? Internet cafe? tourist information point? all three? – as you thread your way through to the Salão Principal where the main act performs. Handsome thick dark green tiling curves away down a service corridor. The main room is already crowded and, without a reservation, a table beside the service entrance is the best you can expect. Nevertheless the carpaccio salad was good and the service attentive. 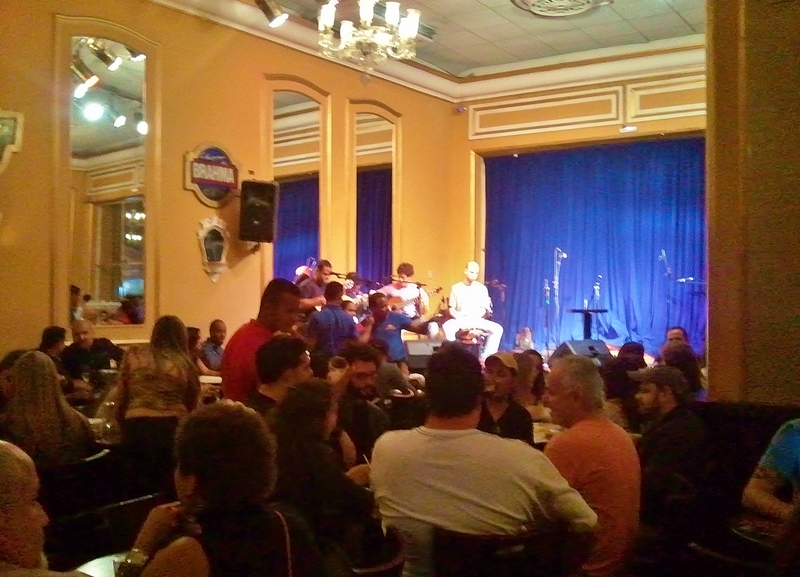 A choro group – cavaquinho, mandolin, guitar and pandeiro – play the familiar repertoire well, though the PA obscures their sound, and the crowded room of birthday celebrants, drinkers, diners and dancers pay scant attention. Called Choro Brejeiro – Provocative Choro – they also appear here regularly. By the reaction of the audience, the main attraction is undoubtedly Caolina Soares. She makes a striking entrance, buoyed by an instrumental build-up from her band and setting her stamp on the evening with her presence. Tall and Juno-esque, she sways and turns gracefully in an eye-catching yellow-gold figured silk gown which she clutches and twitches as she performs. 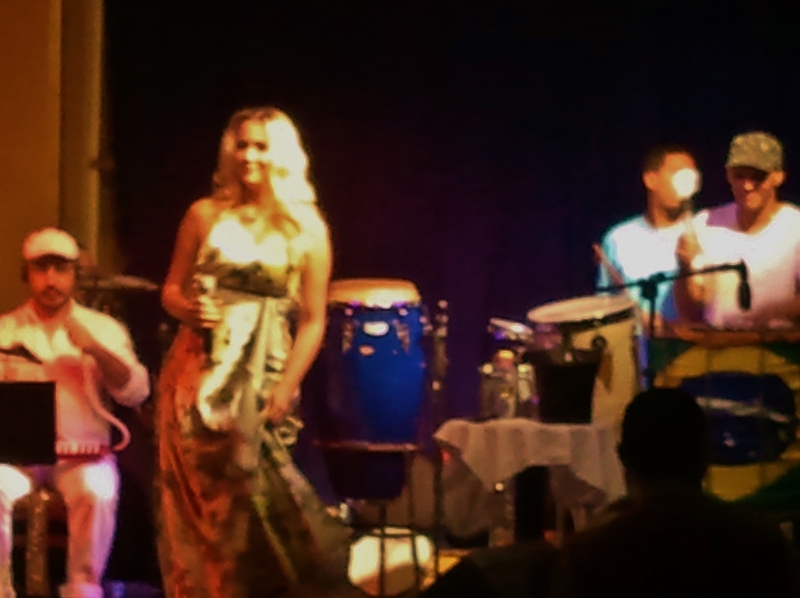 Sambista Carolina Soares with band. Note goofus player. She too is a Sao Paulo institution, a regular performer during carnaval and at the Sambódromo, who also tours internationally. The crowd knows the lyrics well and sings along as she praises the girls from Rio Grande do Sul, and sings of love and desire. This is MPB (Musica Popular Brasileira) with a samba tinge. The Bar is expert at giving its customers what they want: they also operate bars at the Aeroclube Sao Paulo, the capital Brasilia and now in Alphaville in Sao Paulo. 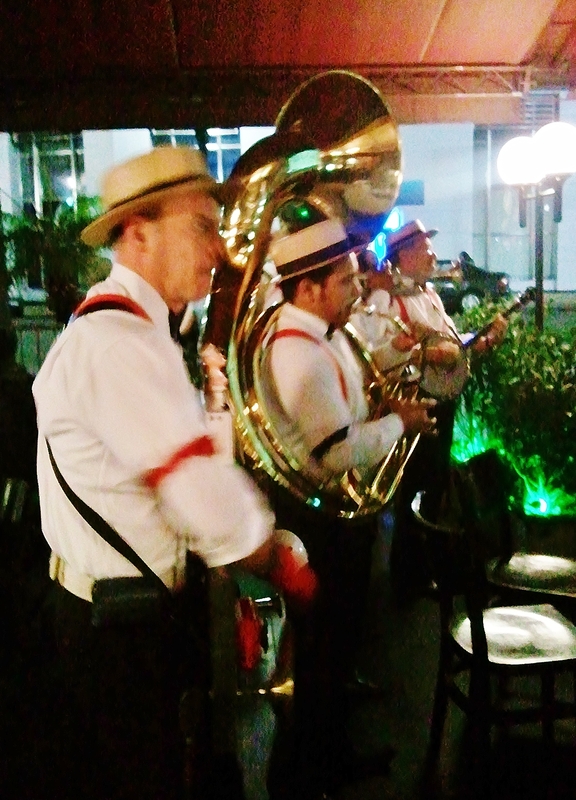 They run a samba school and events such as a vinyl record collectors’ fair at the Sao Paulo Centro bar, and lest you fear they are too MOR, the cutting edge Sao Paulo jazz venue Jazz Nos Fundos programmes live music for them in the adjacent smaller Brahminha. 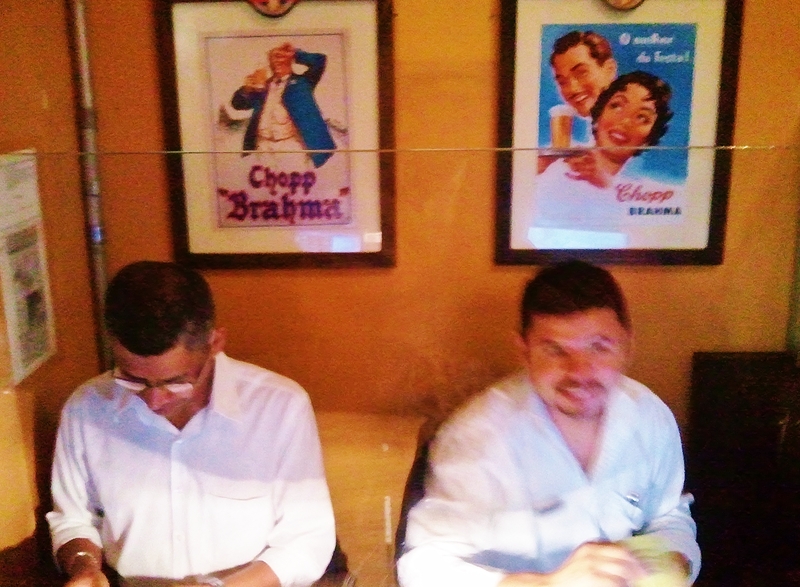 Bar Brahma is indeed as described, “a franchise model developed by the premium new business division of Ambev”. Ambev? “A subsidiary of global brewing company Anheuser-Busch InBev and the biggest brewery in Latin America and the fifth in the world.” (Wikipedia). And the name? An Anheuser-Busch brand, “Brahma is a Brazilian beer, originally made by the Companhia Cervejaria Brahma which was founded in 1888.” Bar Brahma is part of a global business, not just a corner bar with good beer and a samba singer.